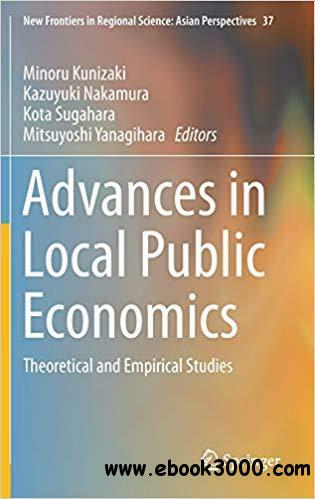 This book introduces recent developments in both theoretical and empirical analyses of local public economics. Theories of those economics as well as empirical analyses have been developed dramatically in various directions in recent years. One direction has been to reflect real economic circumstances, especially in Japan. In the early 2000s, Japan experienced the so-called great merger (or consolidation) of municipalities in the Heisei era (1999 through the present), with the number of municipalities shrinking from 3,232 to 1,821 for increasing administrative and financial efficiency. This phenomenon is mainly due to a drastic change in demography in Japan: the dimishing birthrate and aging population. Following the consolidation, regional coordination has been undertaken to raise overall administrative and financial efficiency. In sum, various types of public policies for tackling the decreasing birthrate and aging population have been carried out. Urban sprawl and the timing of municipal mergers are dealt with from a broad point of view, and public child care services and tax competition are investigated from a policy standpoint. Another direction has been to incorporate new ideas for forming theoretical frameworks for local public finance, most of which have been based on static situations. In the recent trend toward globalization, local governments have attended not only to the welfare of residents but also to the interests of regional economic development. In addition, decision making by local governments has tended to be affected by political activities. Thus, the endogenous growth setting and lobbying activities for the activities of local governments are discussed in the book. With these new directions for analyses, the author tackles the topics of tax competition, cross-border shopping, local provision of public goods, and soft budgets, thus covering a broad range of aspects of local public finance.